customer loyalty for your company. As a businessperson, you know the power and potential that a targeted marketing campaign can have on increasing your company’s brand awareness and revenue. enjoyable, fun and family friendly sports of all time - Auto Racing. • Cole Cabrera, our driver, is racing’s newest and most exciting young star to break the scene. Racing since the age of 4 beginning with motorcycles and quads, Cole’s talent and winning tenacity has helped him progress into Sprint Cars, ASA Trucks and Touring Cars. 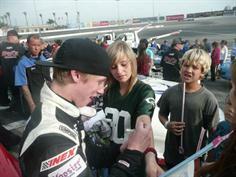 Cole’s multiple wins and focus helped him dominate many different classes which resulted in: 2006 - “Rookie of the Year” at Plaza Parkway | 2006 - “Rookie of the Year at Lemoore Raceway | 2007 - “Rookie of the Year at Plaza Park Raceway | 2009 - “Rookie of the Year” ASA Truck Series at Las Vegas Motor Speedway. This is only the 2nd time in history this level of performance has been achieved by a 14 year old racer. • Advertising and Marketing opportunities with Ag Source Magazine - California’s largest, independently owned Ag magazine. • A professional Marketing campaign directed and managed by 1to1Network Advertising & Marketing whose proven programs are endorsed and supported by the County of San Bernardino. • Access to a loyal and growing fan base of thousands. • Advertising and Marketing opportunities to increase your company’s touch points with thousands of new and existing customers by effectively using: Ag Source Magazine, your Company name prominently placed on the Team Cabrera Race Car, sides & back of the car-hauler, printed promo materials, Social Media Networks such as Twitter, Facebook, Linkedin, YouTube, and the “optimized” Cole Cabrera.com web site which will display your sponsor logo and back links to your web site to help increase your search engine ranking. These activities plus the opportunity of showcasing the car at special events has the potential to deliver 250,000 + customer impressions each month. The Cabrera Race Team offer’s 3 levels of sponsor participation; Platinum, Gold and Silver. We would appreciate the opportunity to speak with you to discover which of these three exclusive levels would be most beneficial to you and your company. Please feel free to contact me if you’d like more information on how you can take advantage of this exciting, new sponsor opportunity.